Ireland President Michael D.Higgins paid a state- level visit to Vietnam and met Vietnamese President Tran Dai Quang at the Presidential Palace on November 7. 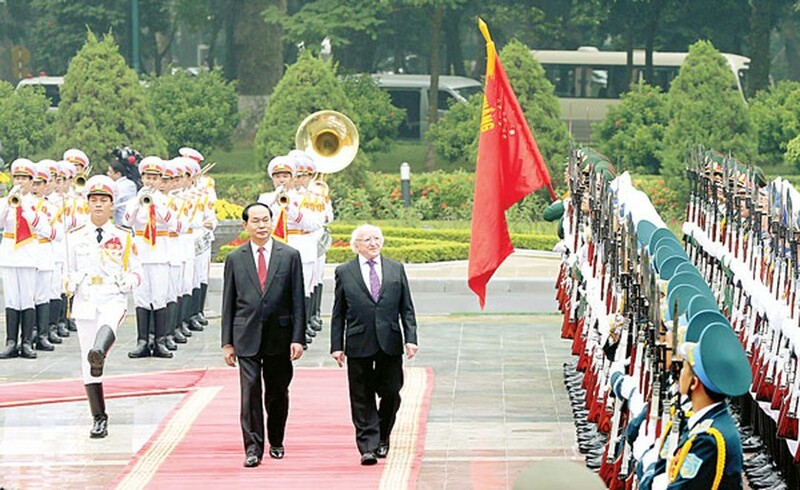 The president- level welcome ceremony for Ailen President Michael D.Higgins in Hanoi. State president Tran Dai Quang expressed with his satisfaction that the first state- level visit of the Irish President paralleled the 20th anniversary establishment of Vietnam- Ireland diplomatic ties adding that he believed Vietnam and Ireland will achieve good multi- faceted friendship and cooperation relations in next years after this visit. The Irish president thanked for warm welcome of the Vietnamese president and people, and was impressive with the country’s economy, society outstanding achievements and international integration; affirming that the Irish goverment considers Vietnam a priority partner in its cooperation strategy. The two sides unanimously continue cooperating in the potential fields such as investment, education and training, green technology, agriculture, health and sustainable development; and annually maintaining exchange meetings for high- ranking delegations. The two leaders highly appreciated the two ways trade turnover as it reached high record in the recent time. 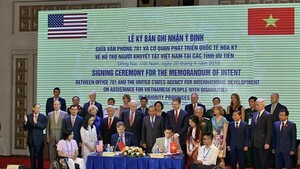 In the context of the most-near-final text of the Vietnam- European Unions (EU) Free Trade Agreement, they unanimously continue creating the best favorable business conditions and calling on business and investment in the fields of re- creative energy, agriculture and food processing, information and media, health and airlines. In the first nine months of this year, the Vietnam- Ireland trade turnover hit US$ 798 million, triple compared to the same period last year. In addition, the Vietnamese president highlighted the donation projects from the partner which has contributed into Vietnam’s socio-economic development and international integration. The Irish goverment will soon proclaim the national strategies about cooperation development with Vietnam in the 2017- 2020 period, and continue assisting the Asian country in the poverty- alleviation movement, anti- climate change and implement for sustainable development targets of the National Nations, said Mr. Michael D.Higgins. In order to further the friendship relations, Vietnam and Ireland will continue maintaining annual culture and art exchange activities. The two leaders also discussed an important role of international peace-keeping, security and cooperation. The two countries pledged to closely collaborate at the international forums such as the United Nations, ASEM and the cooperation framework between ASEAN and EU. In the East Sea issue, the two leaders expressed their similar outlook about solving conflicts via peaceful solutions and international laws, especially being the 1982 United Nations Convention on the Law of the Sea. After the discussion, the two presidents witnessed a sign ceremony to strengthen exchange instruments and cooperation between the two countries’ ministries, departments, businesses and universities in the sectors of education and training, information and technology, medicine equipment, post and telecommunications and others. On the same day, Mr. Michael D.Higgins had a meeting with National Assembly President Mrs. Nguyen Thi Kim Ngan.